Hasbro is currently sellingÂ a series of keychain virtual pets called Littlest Pet Shop Digital Pets. Each one has a nice snap at the top for attaching it to you backpack or belt loop, a charm indicating which pet it is, and two tools to care for the pet. The tools are typically a brush and feeding device. The series includes a cat, mouse, bunny, hamster, monkey, bird, duck, frog, and an iguana. Each pet includes about 30 games to play. When you finish an activity you get virtual stickers for your pet’s digital diary. You feed and brush them using the special tools. The examples shown here are the cat (top) and the mouse. Hasbro has posted the basic instructions for Littlest Pet Shop Digital Pets online. 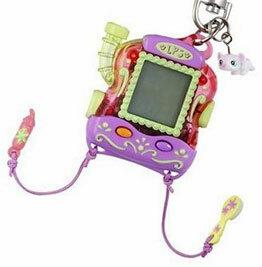 These digital pets are an outgrowth of the Littlest Pet Shop line of small physical collectible pets and playsets, mostly targeting young girls introduced by Hasbro in early 2005 (see 18 Feb 2005 press release).Â In early 2006 they added the digital pets (see 9 Feb 2006 press release). The brand continued to do well and they have continued to expand. In June 2007 Hasbro announced they would start licensing the brand, and expand even further from their backpacks, t-shirts, stationery, and game books. They are looking more products for tween girls including costume jewelry, hair accessories, watches, a new cell phone, pens, greeting cards, calendars, candy, valentines, etc. The brand is supported by its own web site, Littlest Pet Shop. I was playing with the litlest pet shop toys till I was 9 (now 12). 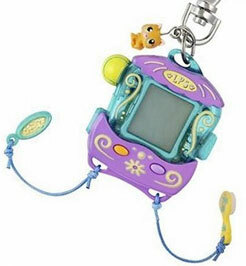 Once I red ’bout this digi-pet and fell in love with it but it wasn’t available in my country’s stores. 🙁 Now that I now how to buy thing from the internat, I know I can buy it from amazon but I don’t want it anymore. Wish I knew about amazon when I was 7! hi everyone. i really love this virtual pet game. i have it. its lovely. u should also buy 1. Heyy ppl im kristie and im giving you a review. I have 2 of them. One is a monkey and one is a cat but my cat one broke down for some reason. Its kinda simple to play, so it often gets a bit boring. It’ll probably last you a couple years. Make sure you change batteries. you can restart anytime by pressing the reset button at the back. You might need a pen.